Posted 6/30/2017 7:24am by Stephanie Bradshaw. We've heard this slogan for years...Know Your Farmer, Know Your Food! There is so much truth behind these words. Knowing where your food comes from and who planted it, picked it and packed it is important...vital to healthy living! How was is grown...what types of seeds, potting soil, minerals were used? This is one of our missions - to help families know, support and glean from a local farmer. 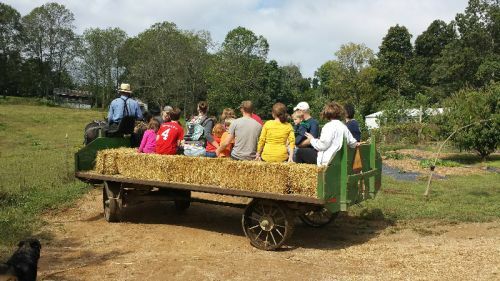 Most people believe that the Mennonites and Amish are organic - or sustainable in their farming practices. However, if you ask them, most are honest about how they are growing. All of the Mennonites in Scottsville Ky are conventional farmers except for the two farmers that we support and they are growing exclusively for their CSA. If someone else is selling produce grown by the Mennonites in Scottsville KY, please know that it is NOT grown organically, naturally or any other word they want to use! Countless people are buying produce from the wholesale docks and reselling it as their own - and claiming it is organic, chemical free or not sprayed. It is appalling how much deception is taking place right in our own cities. If you purchase a tomato from someone - you can't tell if it is organic or conventionally grown...you have to know your farmer. We are blessed to have a ten year relationship with our farmer. We are blessed that he remains ethical, transparent and honest about his farming practices. We are blessed that he and his family are committed to growing food that is natural, chemical free and above organic standards! We are blessed that we do indeed know our farmer - and therefore, know our food! And we are blessed to share this bounty with so many families in Middle Tennessee! Thank you for your continued support of our mission to make healthy food available and affordable! Thank you for trusting us to source the very best food for your family! Posted 6/17/2017 3:55pm by Stephanie Bradshaw. Week six was simply wonderful. The first patch of green beans were ready to be picked - and those Roma Beans were just beautiful. Nothing says summer like snapping green beans! It's one of my favorite things to do...it makes you slow down and enjoy the simple pleasures in life. Growing up, I loved to snap beans with my Granny on her back patio. There was something beautiful about that simple, mundane task. Sometimes, we talked about life - and sometimes, we just sat in silence and I watched her worn hands break off the tail, pinch off the top and snap the bean in half - all in a rhythm and method that I was entranced to watch and mimic. Now, I enjoy sitting on my porch, with my children and snapping beans. If you haven't snapped your beans from this week - go grab your family, a glass of ice tea and snap some beans! It's a beautiful thing! The colors and variety are just beautiful this time of year. The yellow zucchini is such a pop of color. We used ours in a stir-fry...just onions, zucchini, patty-pan squash, a dash of salt and some garlic. Simple, easy, delicious - and goes with just about any meal! Wednesday night we snapped our beans (on the front porch with a glass of iced tea :0) and cooked them in some stock. We had chicken cooking in a skillet with onions and seasonings. I chopped up the red potatoes and added them to the skillet of chicken, added just a little stock, some rosemary, covered and cooked on medium til the potatoes were tender. It was a super easy and such a yummy meal. Oh, and we sliced up some of those heirloom tomatoes and ate those on the side....ah-mazing! Did you receive a little white squash - similar to an acorn squash in your share? Some of you may have received this odd little squash variety named Cream of the Crop. If you haven't decided what to do with it yet, I would advise roasting it! It's one of the best tasting squash out there. I don't even peel mine...just chop it into slices and roast...sometimes with bacon and sometimes with apples - then add cinnamon and maple syrup! You can also, cut it in half, roast it, scoop out the flesh and add a little coconut cream, sweetener of your choice and blend it until smooth into a creamy pudding...super yummy!! What are you doing with your cabbage? We love to roast it in the oven, add some of our favorite seasonings...a little oil or grass-fed butter and....hello yummy!! It's a fantastic side to go with pork chops and roasted red potatoes! It's also really good grilled! One of our members said that they had used their cabbage on fish tacos....now, that sounds wonderful too! We've posted some delicious recipes on our website... like..Zucchini Boats...ever tried them? Oh my goodness, they are something to sing about! What about cucumber, tomato salad with fresh feta cheese and all that amazing basil? Do you have a few Patty-pan Squash lying around? Stuff those bad boys! We've got a recipe that will knock yer socks off! And we can't remind you enough about the Tomato Pie recipe.... it's just shut your mouth good! Go visit our Recipes Page and be inspired! If you're wondering what next week is looking like....here's our best guess: Potatoes, Summer Squash, Kale, Bell Peppers, Celery, Cucumbers, Tomatoes, Sweet Onions, Oregano, and Basil! Be sure to check out the Farm Store this weekend. We've added some Eggplants, garlic and lots of delicious veggies! We've also added some blueberries! They are grown on a different farm by relatives of the Brubakers. They are not organic, but would be considered integrated pest management: IPM Details here. The plants were only treated once at the beginning of the season, and their practices would fall under IPM methods. We are offering these via the farm store, since there are not enough to go around to everyone - and because we only want to use produce that is grown using strictly organic methods in our farm shares. However, just like the berries, if we offer anything in the store, etc - we will always provide you with transparent information on how something is grown. That's our promise to you! Ethical, transparent and honest! Posted 6/10/2017 4:46am by Stephanie Bradshaw. This fifth week of the season was another beauty! There are so many colors in the farm shares right now - and it makes us just giddy to see so many of you getting excited about all this farm-fresh goodness! We are starting to see a shift from spring produce to summer. We will be bidding farewell to most of the lettuce until fall. Some of you may be ready for a break - but this is exactly what eating seasonally looks like. We might be missing all this lettuce in a few weeks! 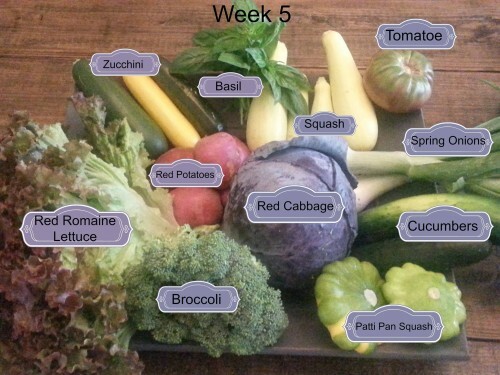 Have you seen the Harvest Report for week 6? If not - check this out: Red Potatoes, Sweet Onions, Squash, Green Beans, Zucchini, Tomatoes, Caramba Cabbage, Cucumbers, Parsley, and Basil! It's starting to taste like summer! Be sure to check out the Farm Store this weekend. We've added more of our super popular Pork Sampler Boxes and a brand new item...a delicious Breakfast Box! It's filled with everything you need to make a mean, lean, delicious breakfast! Amazing smoked and sliced Ham, Delicious Bacon , Pastured Eggs, Fresh Baked Sourdough Bread, and all natural Maple Syrup is a winning combination to whip up a French Toast breakfast that your family will go wild over! Our Recipes page has been updated with lots of Ah-Mazing ideas: Asian Coleslaw, Homemade Sauerkraut, Stuffed Patty-pan Squash, Zucchini Boats and many more! Be sure to head over to that section of our website to receive some kitchen inspiration! Don't forget - Rate Your Share! We LOVE hearing from you! Posted 6/2/2017 10:51am by Stephanie Bradshaw. Week four was unbelievable! So many colors in the shares right now! We are loving all the Spring Greens - and now some of our Summer veggies are starting to make an appearance! Summer Squash, Red Potatoes, Cabbage and Cucumbers are a welcome addition to our dinner plates! Wondering how to use dill? Think grilled salmon, potato salad....and check out our Recipes Page for some inspiration! We've added Chicken and Broccoli Stir-fry, Stuffed Cabbage Rolls, Cucumber, Mustard and Dill Salad and some Yummy Roasted Rosemary Potatoes! Our Recipes page is updated every week with new dishes for you to try! Be sure to check back often to see what's new! Take a picture and let us know what recipes your family enjoys! The tomatoes should be filtering in the shares soon. We may not have many to start with...but once they start rolling in, you will receive your fair share! :) This week we are offering them in the Farm Store until there are enough to put into all the shares. Can you believe that June is here??!! We found the first Zucchinis on the vine yesterday. They are beautiful - and we hope to have lots more of those ready by next week as well. 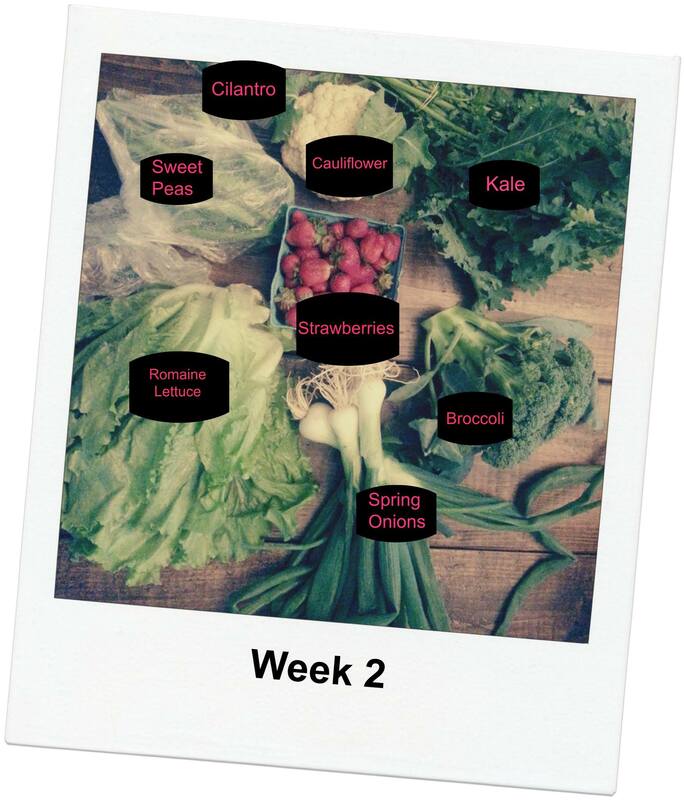 In case you are curious...here's what our Harvest Report looks like for Week 5: Red Potatoes, Lettuce or Cabbage, Zucchini, Cucumbers, Yellow Squash, Spring Onions, Broccoli, and Basil! Be sure to Rate Your Share! It gives us instant feedback on how we are growing! We LOVE to receive feedback from our members! 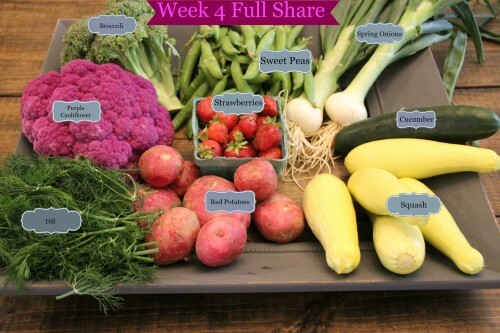 We also LOVE seeing pictures of your Farm Shares and how you are using the veggies each week. Snap a pic and share it with us!! Posted 6/2/2017 9:08am by Stephanie Bradshaw. Just a reminder, the Farm Store is OPEN! We have the first Heirloom tomatoes available this week in the store - limited quantity since they are just starting to come in! This week would be a great time to order some of our Pastured Pork Chops to grill or a Grass-fed Steak. Throw some potatoes on the grill, Zucchini, Squash, Broccoli and even Cabbage! Our Week 5 Farm Share is just giddy to be grilled! Speaking of Grilled - Don't forget that we have grass-fed, grass-finished, local Ground Beef in the store. Hamburgers would be a great meal idea along with roasted potatoes, and all our grill-loving veggies! Top that burger off with a heirloom tomato and your family will be singing your praises! Looking for a quick meal....Try one of our delicious Grass-fed Beef Roast! Thaw it out over-night. Put it in the crock pot that morning with your red potatoes, add a little seasoning (we love Braggs Amino or Coconut Aminos and garlic) - cook it slow and low all day. Chop up your broccoli, cauliflower, squash and onions so that they are ready to roast - or saute when you arrive home. Super fast, easy, delicious - and nutritious dinner is ready within minutes! That's what I'm talking about!! Don't forget to check out Recipes Page for lots of inspiration! We update it each week - so check back often!! Week 3 - Harvest Report and Pastured Pork! Posted 5/19/2017 8:48pm by Stephanie Bradshaw. Harvest Report: Cabbage, New Potatoes, Mint, Peas, Strawberries, Lettuce, Kale and Spring Onions are what we expect to see for Week 3! Don't miss out on our newest addition to the farm store - Pastured Pork Sausage! It's so good! More pastured pork products are being added! Stay tuned! Posted 5/19/2017 8:30pm by Stephanie Bradshaw. Posted 5/12/2017 7:47pm by Stephanie Bradshaw. Thursday was a crazy, fun, hectic, awesome, busy day! We were thrilled to see lots of familiar faces - and so many new ones as well. We were picking, washing, weighing and packing early that morning. It was wonderful to see so much healthy food being poured into our CSA families! The Kale and Spinach was beautiful and we hope that you will try roasting the kale in the oven - if you've never tired it that way. Even easier - wash it, dry it and put it in the freezer. Next time you are making a smoothie, throw some of those frozen leaves in - yummy and so good for you! The spinach is delicious sauteed in some coconut oil or grass-fed butter. Super Good! Did you know that cilantro is a natural heavy metal detoxer? Yep - throw some of that goodness in your salads, in some homemade salsa - or in a lettuce wrap! We even like it in our chicken salad! Be sure to set a reminder to bring your box back at your next pick up. It's one of the ways that we keep the price low by recycling the boxes. If you lose it or damage it - we charge $2. Better yet, order one of our Veggie Lover bags and leave the box with us each week! Be sure to check out the Harvest Report for week 2. The Farm Store is OPEN so go check out the new items that we are offering this week! It's a great way to add some extra items to your farm share or just order more of what you LOVE! 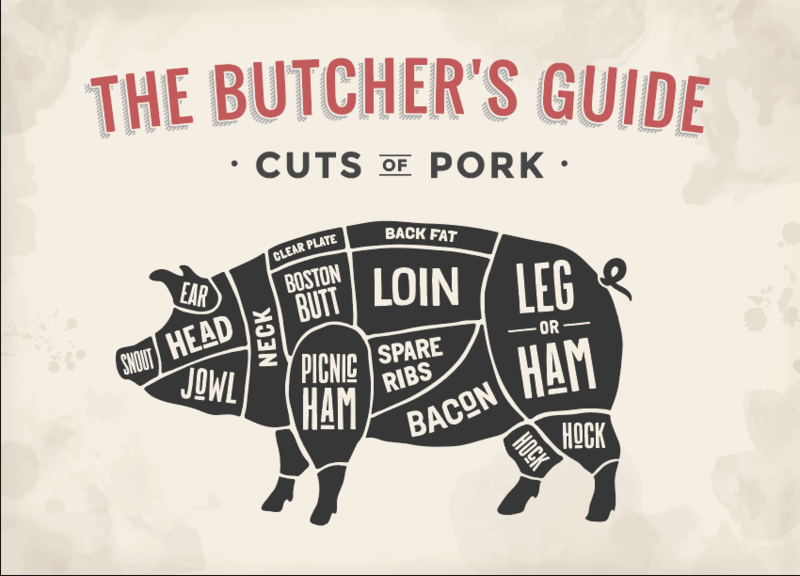 Coming Soon.....Pastured Pork Sausage, Bacon, Chops, Tenderloins, Ham and more! And even more exciting - our Breakfast Box will be making it's debut very soon! Stay Tuned!! Join our Farmhouse Nashville Facebook Group and swap recipe ideas and get the latest scoop on what's new! Don't forget to Rate Your Share and let us know what you thought of this week's box! Just log in to your account and give us your feedback! And hey, if you're feeling extra frisky - jump on over to our Farmhouse Nashville Main Page and give us a review. We LOVE hearing from our families! Posted 5/4/2017 9:43am by Stephanie Bradshaw. Here are two meal ideas for next week's box. Be sure to purchase your grassfed beef from the online Farm store to be delivered with your produce! Instructions: Saute the onions in 1 tablespoon of coconut oil until the onions turn translucent. Add in the ground beef and saute until the beef is pretty much cooked. Use a spatula to stir the beef to ensure it doesn’t clump together. Pour out any excess water produced during cooking. When the beef is pretty much cooked, add in the tomatoes, bell pepper, jalapeno, minced garlic, cumin powder, paprika, oregano, chili powder and salt and pepper. Cook until the tomatoes are soft. Garnish with cilantro and serve in your Romaine lettuce leaves! Instructions: Preheat the oven to 400 degrees. Grease a 2-3 quart casserole dish and set aside. In a large pot, steam or boil cauliflower until tender. Heat 2 tablespoons of oil (we like coconut) in a large skillet or saucepan over medium high heat. Add the onion, peas, carrots and garlic and cook until beginning to soften, around 5 minutes. Add the ground meat to the pan and cook until browned. Add beef broth as necessary to keep the mixture wet. Add the ketchup or tomato paste (if using), and season with salt and pepper. Let simmer while you prepare the cauliflower topping. To make the topping, drain the cooked cauliflower. Mash or puree with a stick blender until smooth. Add 2 tablespoons of butter and season with salt and pepper. To assemble, spread the meat mixture on the bottom of the dish. Top with the cauliflower mixture and smooth with a spoon. Cover with shredded cheese, if using. Bake for 30 minutes or until the top is brown and bubbly. Sprinkle with finely chopped cilantro. Posted 4/27/2017 5:54am by Stephanie Bradshaw. This week I tasted my first strawberries of the season....and boy, were they delicious! Picking sweet red berries on a beautiful sunny day - and popping them straight in my mouth, it was lovely! I can't wait for you to try them too! One of the best parts of Spring, no doubt! It's hard to believe that our season is about to begin. We plan to start the second week of May. Tuesday May 9th and Thursday May 11th. So much hard work has been going on behind the scenes since...well, January! Planning for this year began in December as we were mapping out what to plant. Starting organic seeds in organic potting soil in the wee days of winter and keeping them warm in the greenhouse. Plowing fields, planting and praying for those tender plants and the families that we serve. We listened to the feedback that we received from our members and have planted more broccoli, cauliflower, spinach, okra, green and red cabbage, English Sweet peas (one of my favorites), and snow peas for this spring....and of course, rows and rows of strawberries. The romaine lettuce is gorgeous and the red leafy lettuce will make your salads pop with color. The farm is just bursting with color, new growth and life! It's just such an energizing time of the year. From the plants to the animals - so much newness! Some of the barnyard hens have new little chicks running around behind them. It's nothing short of precious to see them scurrying around following after their mama. There are new lambs out on pasture, new calves and even a couple of colts. Yes, Spring is a marvelous time of the year! Speaking of marvelous, we've added some new drop off locations this season. Percy Priest Elementary in Forrest Hills is our most recent new-comer and we are excited to be part of this tight-knit community! We are also thankful to be partnering with the Donelson-Hermitage YMCA this year and the Sumner county YMCA. We love what the Y stands for and their dedication to community health and well-being - so it just makes sense to offer locally grown, natural produce too! We look forward to building a strong community of support in these areas. Each year we try and go above and beyond to support our members. Last season we introduced the Farm Store, which was a huge hit. We also offered the Anytime share for those that wanted to order on their schedule - with no commitments. This year we are launching Home Delivery in Franklin and Mt. Juliet. Depending on how this new adventure goes...we may offer more areas in the future. I am super excited about our newest offering in the Farm Store! In the past we have offered bulk meat orders to our members and community. However, we realize that not everyone wants to buy half a hog or beef all at once. This season, we are offering individual cuts delivered with our farm shares and store orders. Add a pound of ground beef - or sausage from the farm store to your order and we will deliver it to your pick up location - or straight to your front door if you live in our home delivery areas. Pretty snazzy! My hope is that this will be another way that we can make pastured meats available and convenient to order and pick up within our community. That's our goal...to bring the best of the farm to your family! Looking forward to seeing all your veggie-loving faces real soon!